Thinking about the traditional symbol of Valentine’s Day, the heart, makes me want to talk a bit about the heart of Malvern. Sure, we strive to be thought-provoking leaders in materials characterization, but the technology we are able to engineer isn’t the heart of the company. It’s the employees (cue sappy music here). But, in all sincerity, it is the truth for this company. Bear with me here as I walk you through my brain. In January we held our annual Malvern Americas Kick Off meeting, which is a wonderful time for all of our people in the field and remote working teammates to meet up with us in one place. You can put faces to names that you speak with on a regular basis, relax and enjoy the experience that Malvern orchestrates in order to have a synergistic and productive meeting, but there is also time for some fun. One of the evenings, Malvern brought in a mind-reading comedian. Strange combination, right? This very talented entertainer was Eric Dittelmann, made famous by his run on season 7 of America’s Got Talent, who is also a local to Massachusetts. Eric does a lot of different tricks but our favorite was when he chose a volunteer to color in a picture with different regions in any color they choose and then unveiled his version of the same picture (that was completed before the show) identical to the one that the volunteer just did! 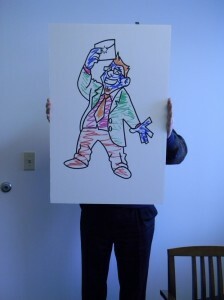 Here is Mr. Randy Byrne’s picture that he colored. He stayed in the lines, but was thinking outside of the box with the color choices! If you want to figure out how Eric can pull off these interesting tricks, you’ll probably want to read up on the art of body language and how to use words to lead a person to a conclusion. The fact is, Eric uses a lot of perception during his performances. Just like in poker, people can have “tells” in their body language which can give away what they are thinking or what their next move may be. Even though it may be a simple concept, I can confidently say that it truly takes talent to develop the skills to be a detail-oriented and perceptive person. Which brings me to the Malvern team. When we are speaking with anybody that contacts us, we really have to be perceptive with understanding what they are asking us in order to give them the most appropriate answer. What does that mean? It means that nothing in the world of science is straight-forward and easy. Instead of just listening to what a customer is telling us about a problem or a need that they need to fulfill, our employees have to dig deeper and read into the language. We are invested in our products and also our customers, so we are determined to understand the entire picture in order to give the best recommendation we can. We aren’t here to tell people what they need in order to bring in revenue – oh, your instrument isn’t turning on? Guess it’s time to buy a new one! No, we are here to help people make the best decision for their needs. I find that our team does that really well. A lot of people will request a quote on our website for a specific instrument but don’t share what their application would be. Instead of sending a quote and not interacting at all with the person, our team reaches out to make sure that whatever we offer them is perfect for their needs. That also means that our team will tell them if it’s not suitable for their application. For a company to have employees that aren’t looking to simply tell a potential customer what the instrument specifications are and view them as if they are simply revenue, instead of a person, makes me excited to be a part of that team. So, in a very vague view, I feel as though Malvern Instruments has a team of mind-readers. People that don’t see things as simple. Problem solvers who don’t just use their brains, but use their love for science to dig deeper and provide all the information and skills they can to get the customer exactly what they need, even if they aren’t sure what that is. I think that’s pretty impressive. Impressive enough to even give these people Valentine’s Day chocolate ON Valentine’s Day (paying FULL PRICE!) So, this Valentine’s Day, think about what you put your heart into. And then wait a day to feed yourself some delicious 75% off chocolate because, let’s be honest, you deserve it.